This list provides an overview of books concerned with the general appreciation of music. We welcome feedback, suggestions, additions, and corrections to this information. Vintage Guide to Classical Music . Jan Swafford. Vintage Books. 1993. ISBN 0679728058 (paperback). Illustrated in black and white. This history book has essays on composers and works, periods, includes a glossary and index. Experiencing Music. Vagn Holmboe, with Paul Rapoport (Editor & translator) and foreword by Robert Simpson. Toccata Press. 1994. ISBN 0907689159 (hardcover), 0907689167 (paperback). This is the first appearance in English of these important essays, originally published in Danish, under the title Music - the Inexplicable. To the translation of this book several other essays have been added. 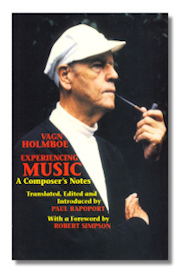 Professor Paul Rapoport contributes a lengthy introduction to Vagn Holmboe and his music. Lectionary of Music. Nicolas Slonimsky. Anchor Books, Anchor (formerly Doubleday). ISBN 0385414218 (paperback). This is not really a dictionary or encyclopedia. It is a delightful collection of tidbits, small and large informative entries and essays about musical subjects, from belly dancing to Bach. Leonard Bernstein's Young People's Concerts. Leonard Bernstein, with Gottlieb, Jack (Editor). Doubleday (Anchor). 1992. ISBN 0385424353 (paperback). A revised and expanded version of the 1962 book. Each chapter is taken from one of the popular televised lecture-demonstrations by Bernstein and the New York Philharmonic Orchestra. A bit of rudamentary musical knowledge would be helpful, since there are musical illustrations througout the book. Highly recommended for all ages. The First Hundred Years. Nicolas Slonimsky, with Kostelanetz, Richard (ed). Schirmer (Macmillan). 1994. ISBN 0028718453 (hardcover). This is a collection of Slonimsky's writings gathered from Baker's Biographical Dictionary (to which he contributed and edited), Perfect Pitch (his autobiography), and numerous other works which are out of print now (Music Since 1900, Lexicon of Musical Invective, Road to Music, A Thing or Two About Music). Delightful volume. H.L. Mencken On Music. H. L. Mencken, with Cheslock, Louis (ed.). Reprint Services Corp. 1990. ISBN 9991827609 (hardcover). Subtitled: His writings on Music, Together With an Account of H. L. Menchen's Musical Life and a History of the Saturday Night Club. Many articles are from the Baltimore Evening Sun. Articles range from popular music, through opera and the classics, band music, morals and music, and wedding music. Photographs and illustrations. Clear and witty writing and opinionated prose. The Classical Music Experience. Julius Jacobson, with Kevin Kline. Sourcebooks Inc. 2002. ISBN 1570719500 (hardcover). This is a great introduction into the world of classical music. 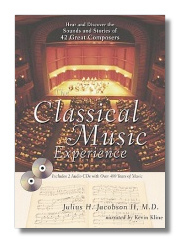 The book includes a CD with the works of over forty composers spanning 500 years. Dictionary of Composers and Their Music. Eric Gilder. Holt, Rinehart and Winston. 1993. ISBN 0517092956 (hardcover), 0030071771 (paperback). Part one: an alphabetical list of composers and their music arranged chronologically (most popular or significant works only) Part two: Chronological survey of music from 1300 to date of last revision. Part three: Timeline. "And Do You Also Play The Violin?". 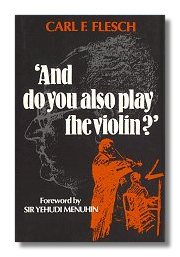 Carl F. Flesch, with foreword by Sir Yehudi Menuhin. Toccata Press. 1987. ISBN 0907689361 (hardcover), 090768937X (paperback). Carl F. Flesch is the son of the famous German violinist Carl Flesch (1873-1944) and grew up in the Berlin of the 1920s and '30s. He thus came into almost daily contact with some of the foremost musicians of the century – Furtwängler, Kreisler, Schnabel, Heifetz, Thibaud – including, of course, his father's pupils – Rostal, Haendel, Neveu, and many others. "And do you also play the violin?" was a question he was frequently asked as he grew up, and it explains his intention in writing this book: he had, in his words, "a ringside seat" to observe these musicians from close quarters and writes about the men and women behind the famous names; examining, often with some humour, the relationship between teacher and pupil, the pressure on public performers, life as the child of a famous parent, and the effect on German musical life of the Nazis' accession to power. Music: An Appreciation. Roger Kamien. McGraw-Hill. 2000. ISBN 0072902000 (hardcover). This is the hardcover version of the seventh edition of the best-selling music appreciation text for colleges and universities. Praised for its clear and engaging prose, the text is also beautifully illustrated with both color and black-and-white photos. Throughout the text, timed Listening Outlines guide users through some of the great works of music in the classical repertoire. Recordings are available for all of the compositions discussed in the book. The Enjoyment of Music. Joseph Machlis, with Forney, Kristine. W.W. Norton. 1999. ISBN 0393972992 (hardcover), 0393973018 (paperback). Eighth edition, hardcover with 8 CDs, paperback with 4 enhanced CDs.